Stereotactic radiosurgery (SRS) is accepted as an effective treatment modality for patients with a cerebral arteriovenous malformation (AVM). However, several delayed complications following SRS for AVM, including parenchymal hemorrhage, radiation necrosis, dural arteriovenous fistula, and cyst formation, have been reported in 3.2-19.8% of patients. Chronic-encapsulated intracerebral hematoma (CEIH) is a rare cerebrovascular disease that behaves as a slowly expanding lesion with a gradual onset. The structure of the capsule in CEIH consists of an outer layer of collagen and an inner layer of granulation tissue. It is well established that CEIH is associated with vascular malformations such as cavernous angioma, venous angioma, or AVM. However, there are few reports of CEIH presenting after radiosurgery for AVM. ,,, Herein, we report a rare case of CEIH after SRS for AVM. A 49-year-old male presented with a right-sided facial numbness. Computed tomography (CT) showed hemorrhage in the left temporal lobe. 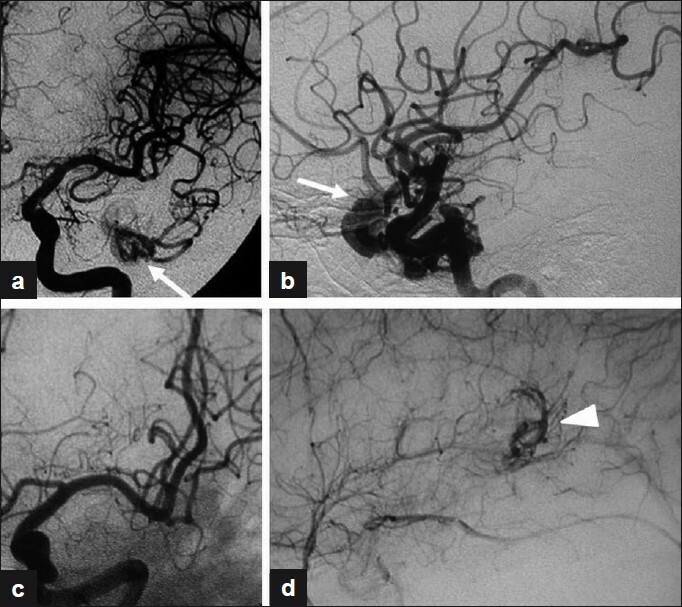 Cerebral angiography revealed an AVM supplied by the anterior temporal branch of the middle cerebral artery (MCA) [Figure 1]a and b. Transarterial embolization and surgical excision were performed. Follow-up cerebral angiography 8 months after surgery showed no residual nidus. 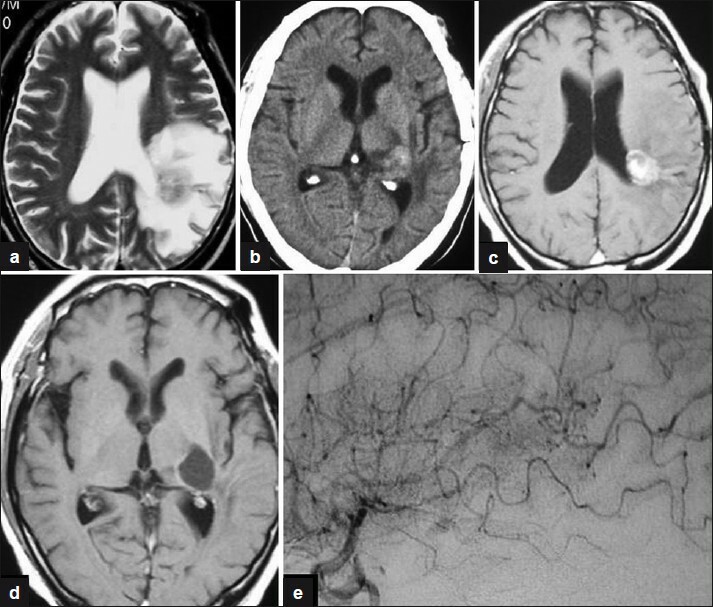 However, another AVM supplied by the cortical brunch of the MCA was detected [Figure 1]c and d. Twelve months after surgery the patient underwent SRS (linear accelerator radiosurgery [LINAC], with a marginal dose of 18 Gy) for the AVM supplied by the cortical branch of the MCA. Follow-up CT 3 days later showed no abnormal findings and 14 months after SRS the patient presented with aphagia. Magnetic resonance imaging (MRI) showed a small-enhancing lesion close to the left lateral ventricle and marked white matter edema [Figure 2]a. At that time a diagnosis of radiation-induced necrosis was made. Steroids were administered resulting in transient neurological improvement, whereas the white matter edema observed by MRI fluctuated in extent. 34 months after SRS, the patient presented with numbness of the right upper and lower extremities. CT showed a small hematoma in the left basal ganglia [Figure 2]b. The patient was kept under observation. 43 months after SRS, the patient presented with memory disturbance. MRI showed a small-enhancing mass close to the left lateral ventricle, with a hematoma cavity in the basal ganglia [Figure 2]c and d. Cerebral angiography revealed no visible residual nidus [Figure 2]e. Surgical excision was performed. 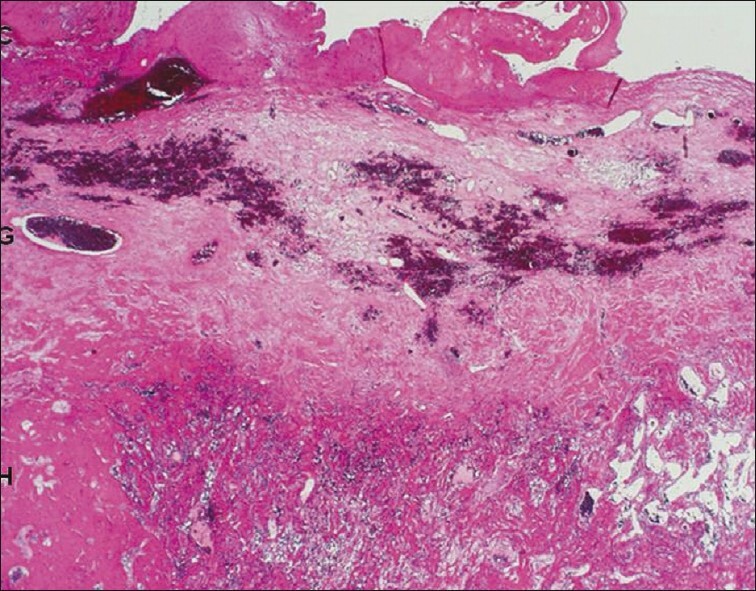 Description of operative findings Histological examination revealed that the capsule consisted of an outer collagenous layer and an inner granulated layer with deposits of hemosiderin, which was compatible with CEIH [Figure 3]. There was no evidence of residual AVM (to be confirmed) postoperative course was uneventful. Although CEIH is a rare entity, it has been reported with increasing frequency in recent years. Approximately 60 cases with CEIH have been previously reported. However, to the best of our knowledge only seven cases of CEIH after radiosurgery for AVM, including the present case,  have been reported. ,,, The clinicoradiological features of all seven cases are summarized in [Table 1]. Interesting features of patients with CEIH after radiosurgery include a male predominance (male:female ratio 5:2), high frequency of basal ganglia involvement (6 of 7 patients), long interval from radiosurgery to diagnosable CEIH formation (mean, 5.4 years; range, 2-11 years), and high rates of presence of residual nidus (all patients received surgical excision). There were differences in types of SRS (Gamma knife (GK) in four patients, LINAC in three patients) and marginal doses (18-22.5 Gy). Nevertheless, further studies on the relationship between types of SRS or dose and the incidence of CEIH are required. We suggest that at least a 10 year careful follow-up is required for patients receiving radiosurgery for AVM, especially those in the basal ganglia with a residual nidus. The management of CEIH is controversial. As CEIH formation after radiosurgery for AVM indicates a high possibility of residual nidus, even if cerebral angiography cannot detect an abnormal lesion, surgical excision should be recommended if possible. 1. Yamamoto M, Hara M, Ide M, Ono Y, Jimbo M, Saito I. Radiation-related adverse effects observed on neuro-imaging several years after radiosurgery for cerebral arteriovenous malformations. Surg Neurol 1998;49:385-97. 2. Fiumara E, Gambacorta M, D'Angelo V, Ferrara M, Corona C. Chronic encapsulated intracerebral haematoma: Pathogenetic and diagnostic considerations. J Neurol Neurosurg Psychiatry 1989;52:1296-9. 3. Kurita H, Sasaki T, Kawamoto S, Taniguchi M, Kitanaka C, Nakaguchi H, et al. Chronic encapsulated expanding hematoma in association with gamma knife stereotactic radiosurgery for a cerebral arteriovenous malformation. Case report. J Neurosurg 1996;84:874-8. 4. Maruyama K, Shin M, Tago M, Kurita H, Kawahara N, Morita A, et al. Management and outcome of hemorrhage after Gamma Knife surgery for arteriovenous malformations of the brain. J Neurosurg 2006;105:52-7. 5. Takeuchi S, Takasato Y, Masaoka H, Hayakawa T, Otani N, Yoshino Y, et al. Development of chronic encapsulated intracerebral hematoma after radiosurgery for a cerebral arteriovenous malformation. Acta Neurochir (Wien) 2009;151:1513-5. 6. Nakamizo A, Suzuki So, Saito N, Shono T, Matsumoto K, Onaka S, et al. Clinicopathological study on chronic encapsulated expanding hematoma associated with incompletely obliterated AVM after stereotactic radiosurgery. Acta Neurochir (Wien) 2010 Oct 8. [Epub ahead of print]. 7. Foroughi M, Kemeny AA, Lehecka M, Wons J, Kajdi L, Hatfield R,et al. Operative intervention for delayed symptomatic radionecrotic masses developing following stereotactic radiosurgery for cerebral arteriovenous malformations--case analysis and literature review. Acta Neurochir (Wien) 2010;152:803-15. 8. Takeuchi S, Takasato Y. Chronic encapsulated intracerebral hematoma: A rare complication after stereotactic radiosurgery for cerebral arteriovenous malformation. Acta Neurochir (Wien) 2010 [Epub ahead of print]. 9. Hohenstein A, Erber R, Schilling L, Weigel R. Increased mRNA expression of VEGF within the hematoma and imbalance of angiopoietin-1 and -2 mRNA within the neomembranes of chronic subdural hematoma. J Neurotrauma 2005;22:518-28. Ilica, A.T. and Rodrigues, F. and Maluf, F. and Aygun, N.